Hi Shaney, please pass on our thanks to all involed in providing music last night. I can’t tell you how many people said it was the BEST wedding band ever and the age range was from 84 to 4. The dance floor was never empty and Shane played a stormer. I thought we would get to say a proper goodbye and ‘thank you’ but we were all a bit ‘tired’!!!! I have no problem recommending Harlequin to anybody and wish you and the band all the very best for 2011. You are worth every penny. Huge thank you to Shane and all of Harlequin for rocking the dance floor in Springfort Hall on Saturday night. Ye really made our wedding day a great celebration and memorable for everybody. So glad we booked you guys. And Happy New Year to you all too! The night of your life or your money back. Lol. You won’t be hearing from us in that regard. Thanks for everything you did for us. Everything was so professional. Thank you thank you thank you again for playing at our wedding. You guys really made the night special. Everything you said it would be and more. Trevor and I had an absolute ball. “Harlequin were the best option for our event entertainment. The spectacle energised, enthralled and exhausted our guests yet leaving them howling for more”. 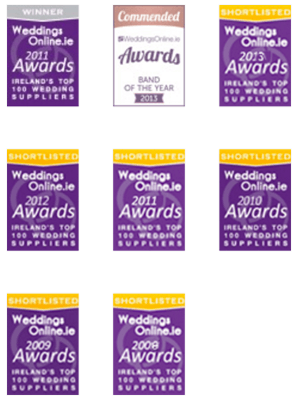 Who is the best wedding band in Ireland? Having read the above – you tell us… Please enquire with Rebecca at our office for a comprehensive list of our testimonials.